In a deep medium sized saucepan, combine the dry lentils, the onion, garlic, carrot, celery and chicken stock. Bring to a boil over high heat, reduce to a simmer/low boil and allow the lentils to cook until just tender, about 25 minutes, but test them at 20…you don’t want them mushy. When the lentils are done, drain the liquid, remove the solid onion, garlic, carrot and celery, and place the lentils into a bowl to cool a bit. While the lentils are cooling, make your dressing. Combine the parsley, thyme, vinegar and dijon in a small bowl with a whisk. Add the olive oil in a slow stream, whisking to emulsify. Season with the salt and pepper. To the warm lentils, add the diced carrot, celery and red pepper, and stir gently to incorporate. Pour the whisked dressing over the salad, and stir gently to coat. You can serve immediately warm, or allow about 30 minutes for the flavors to develop and serve at room temperature, or serve it chilled. This is wonderful with a bit of grilled salmon served over it. We also enjoy it as a side dish to just about anything grilled, and as part of a veggie meal…you can’t go wrong! Will keep in the fridge for a few days. This entry was posted in Food, Recipes, Salads and tagged De Puy Lentils, Easy side dishes, French Lentil Salad, Haiku, legumes, make ahead recipe, Vegetarian by bitsandbreadcrumbs. Bookmark the permalink. And these French lentils look delicious and are so healthy! I’m so glad you like it, Charlie Louie, thanks! And the salad, which is now chilled, is great for the now not-so-wonderful weather we’re having. It feels beastly hot out right now in the upper nineties, and is moving towards 106 to 107 on Saturday, yikes! And it’s dry as a bone out there. I don’t think I’ll want to turn on my oven all weekend. Hi Claire, and thanks for your great comment. I’m also a fan of lentils and especially in salad. You’re right, this one is tangy and fresh tasting…a bit addictive, actually! 🙂 I was just thinking of upping the tang by sprinkling a bit of soft chevre on top! We are heading into the high 90’s and humid. This lentil salad is very timely and will make the perfect meal (lentil is a protein no need for any other). I would serve it in lettuce wrap and end the meal with a big bowl of chocolate ice cream. What’s not to adore here?! 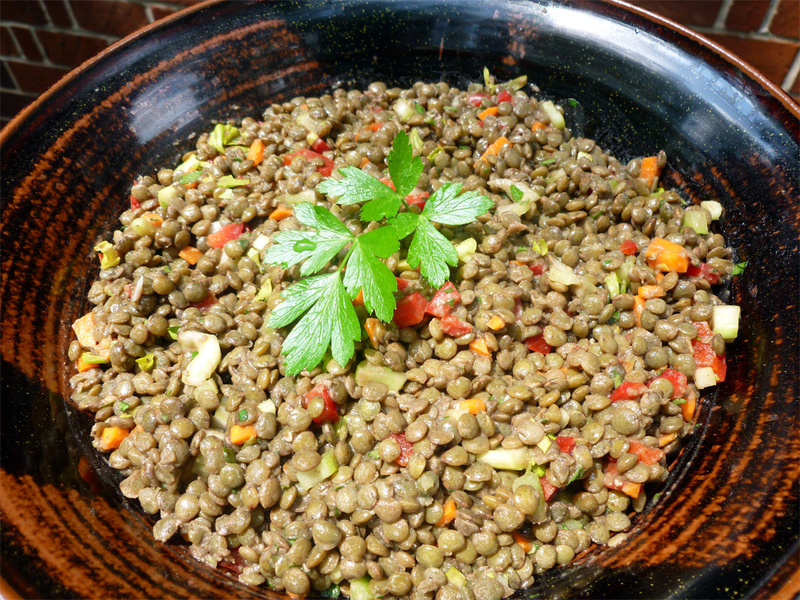 Lentil salad is one of my favorite things to eat. Yours looks so earthy and flavorful. The haiku was so fun and I ADORE your new header. Did you design it yourself? It’s one of my fave things to eat, too, Geni, and thank you very much for your compliments…so glad you enjoyed the little haiku. Yes, I do all my own headers, for better or whatever! 😉 I have dreams of far more illustrative headers, but no time so far. Perhaps for the fall edition! Hahaha.. I LOVED your haiku.. it was fun and zippy!! I love lentils.. and your title says it all!! Very fun recipe today!! Why thank you, Barbara…that’s quite high praise from a true poet such as yourself. It was fun to play with an “almost” haiku, but I had a hard time getting the WP template to allow me to indent what I wanted! I’m glad you like the recipe, too, it’s our new fave salad around here! I could control the double space/single space issue by holding the shift key, but if I had 3 lines together it would indent all 3 instead of just the one I wanted. Arrrrrgh! Never could figure it out. A lentil haiku — now there’s a first! I love your new masthead — now I know why my husband didn’t catch any fish on his trip with the boys….he’s went to the wrong place. (I need to know the name of your lake…he, he) I’m adding this salad to my list to try this summer. I’ve been having fun trying lots of new salads with different grains. This looks simple but flavourful. Hi Barb, thanks so much for your compliments on the masthead! I needed a summer setting, though how I wish we had a lake where I could get fresh fish here…this one is in my dreams! It’s getting so hot, we may be eating nothing BUT salads around here…for sure this weekend. I hope you enjoy this one if you try it. And Norma’s idea to wrap it in a lettuce leaf is brilliant! What a fun way to begin your post, Betsy! I really do enjoy lentils but I never seem to remember to buy them. I need to change that. For days hot as today, having a salad as good as this one in the fridge is worth its weight in gold. I know I would have loved it for dinner this evening. Must remember to buy lentils! I’m so glad you enjoyed my little creative attempt, John, thank you! I’ve had the lentil dropsy problem, too. I think I was actually looking for beans when I happened upon these de puy lentils at such a good price (for here), and I felt I had to get some but couldn’t remember the last time I’d cooked any. Now I’m hooked! And yes, so hot and will be 107 here tomorrow and we have such bad air, code red smog today and for the next 3 at least. One of the down sides of city life. Wonderful – love lentils in any form…hot, cold, sdalad, soup. Gorgeous dressing! Betsy this looks fantastic! My husband and I were just discussing adding more lentils to our dinner menu this summer. I think this will be our first dish! Yummy! Thanks so much, Karista and I hope you will try this…let me know if you do. We think it is seriously yum! Great for this hot weather, too. Just LOVE the creative use of words, or poem at the top! I’m with Jed, I adore lentils but never think to make them myself. I’ll bookmark for when we return next week from Illinois and Wisconsin visiting friends. Tasty haiku and tasty dish! Healthy for you and very tasty! Now if I was clever I would leave you a lovely haiku in reply…sigh. Not feeling so clever tonight. What a great idea for such a yummy salad. I love the crunchy bits with the lentils nice texture contrast. It is way too hot to cook so being able to make this and eat off of it for a couple of days would be grand. I still haven’t tried lentils de Puy, Betsy. I don’t care for lentils in general, but I have heard that these are special. I think they are special, Sharyn. They do taste different to me than regular lentils and they have a firmer texture. Perhaps you might try them sometime? Adore Puy Lentils! And I like the idea o fadding thyme to the salad dressing.